“Sometimes you just have to be a lion.. and face things” ---Debbie Reynolds to me when I asked her how she emotionally survived being fleeced by two husbands, losing it all, and having to start over. And over. And over. I loved my mother in law. I feel so blessed to have been able to spend seven years with this magnificent woman. We had a lot in common, and we did some seriously good deep talking over those years. Neither of us cared much for small talk. What a relief for us both. Deep talking is what I love to do, which is probably why I make my living as a hypnotist. I love real life, real feelings, imagination, and life experience. I have so many memories of those conversations. What a comfort it brings me to know, that the memories do not leave with the person who gave them to you. With Debbie, there were no limits, and when we disagreed it got even more interesting to see who had a better argument to keep our position. She was strong-willed and stubborn, but a more generous heart I have never seen. If anything, I thought she was too loyal to people who did not deserve it, people who let her down, but that would be a judgment on my part and for me it was just painful to see bad behavior rewarded. She did everything for everyone. At bedtime, I would tuck her in, making sure her sheets and blanket were tucked underneath her like you would carefully bundle a child. she noticed (she always noticed everything) and would say, “you’re such a good girl” and that would just make my day. As a little girl, no one had ever tucked her in quite like that, and, as a little girl; no one ever said those words to me when I most needed to hear them. I didn’t know that at the time, but I know it now. When Todd and I decided to get married, Carrie, Debbie and Carrie’s incredible assistant, Byron, planned our wedding. Debbie was not feeling well when we decided to get married, and so Carrie thought it was best if we got married at her home so that Debbie could come and go easily if she didn’t feel well enough to stay during the reception. Carrie was Todd’s “best man.” Carrie did what Carrie wanted and everyone understood that, so I didn’t think a thing of it when she smoked an e-cigarette throughout the entire ceremony. At one point she spontaneously suggested that Todd, I, and our friend and pastor Henry Cutrona, take a hit off of the “peace pipe” to seal the deal. What were we going to say? We all took a puff. The guests howled. During the prayer before the rings, when everyone’s eyes were closed, Carrie dropped the ring. Ping! It went rolling in a circle, causing a few people to crack their eyes open and sneak a peek to see what was going on, only to find her on all fours looking for the ring before the prayer ended. I admit, I was peeking. The look on her face was priceless. She found it in time.On this last Christmas Eve, as I was tucking Debbie in, I asked her how she was being so strong amidst such a painful crisis, and she said, “all of this is very stressful, I am trying to keep my stress levels down, because if I allow it, it will take me.” Now thinking back, I realize at that time, there was still some hope that her daughter might somehow miraculously pull through, and if that happened, then by God, she was going to be here, strong of mind and body to be by her side. After Carrie left for her next stop, Mom decided to go “Home” and be at peace with her girl.Losing one was enough of a shock, losing them both at once was unimaginable. 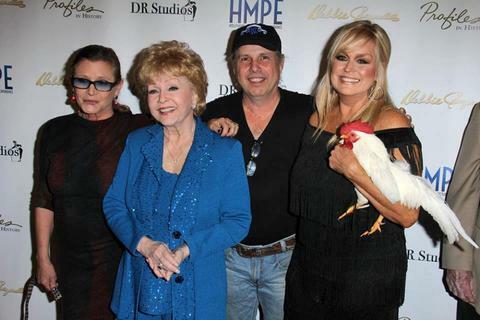 Never in a million years did we see that coming.To say I will miss Debbie, and Carrie, two of the most powerful personalities I have ever known, seem like insignificant words. It will be much more than missing. I’ve now been home for 5 days, the first three spent with my face planted in my pillow. My body finally fell apart. Three weeks of little to no sleep, incredible compounding stress, keeping emotions in check to get through what needed to be gotten through, all takes a toll. But then, you know all this. A broken heart is a broken heart, and who hasn’t had one of those? We are all in this life together. There aren’t, but I don’t want to let another day go by without words. So I write. What’s happened has me contemplating life, and how tenuous it can be. These events have taught me the most valuable lesson anyone can learn through a crisis: life can change in an instant. In one single moment, life changed in an unspeakable way, as it does for millions of others, on any given day. To all of you, I say this: I spend a lot of time thinking about you. I pray for you and want you to know that your loved ones are at peace. They may have graduated to Heaven, but they never really leave us, because Love, is eternal. Our thoughts of them keep them alive in our hearts. We will be okay, and even better than okay, it just takes time and a willingness to know that it’s okay to be okay. There are just some things we cannot change, and if we don’t learn to accept what is, they will most certainly change us. In the midst of sadness, I also want to remember that life can also change instantly in an exhilarating, glorious, amazing, majestic, magnificent way…and we must take charge of recognizing this, and not allow that wonderful feeling to pass us by. Life is but a breath in the wind. Don’t waste it. Treasure it. Be grateful for it. Respect it. Live it. Be joyous in it, no matter what. Let people know how you feel. Kiss people, Hug people. Give flowers to the living.In closing, I want to say this…while we were grieving as a family, we felt the world’s arms around us, and we realized that you also, were grieving. This gave us strength. Thank you all so much for that. Love does heal. Love is everything.